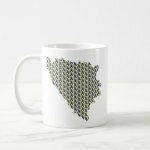 Two new designs of customizable mug have been added to our European collection. These are template products, which make it easy to substitute your own text for the placeholder text. Substitute the name of a person or organization plus a special message or anniversary details to create a personalized gift or commemorative item. 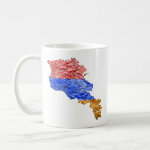 The first design features a flag-colored map on one side with your text on the other side while the second features a map of flag hearts on one side with your text on the other side.